Thanks MS. But I don’t want to disconnect from the Internet. 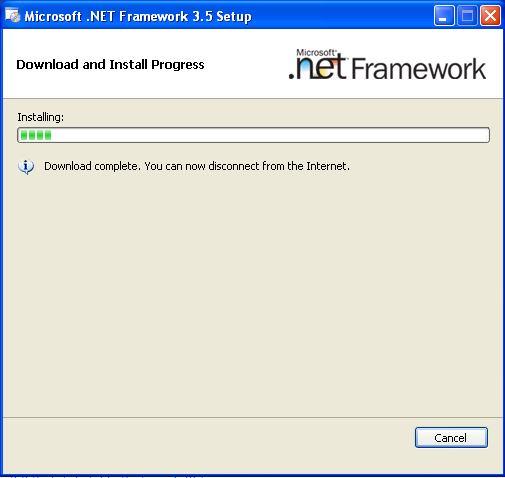 MS .Net Installation - You can now disconnect from the Internet. I almost blew it too by clicking the “Cancel” button because (1) I thought it was all done and it was the only button shaped thing available, (2) I do not want to disconnect anyway. Luckily, I noticed in time that the progress bar was still working. I know Microsoft takes a lot of abuse for no reason other than that they are M$, but it’s just so easy with stuff like this.